Hello! By the time you’re reading this, I should either be in Dallas or on my way to it, but here’s one last guide to an Expanded deck, in time for the event. Something I like about the Expanded format is that you get a variety of very different strategies. There are aggressive decks like Vespiquen / Flareon and Archie’s Blastoise that just Prize race the opponent, lock decks like Trevenant, and control options going from Wailord-EX to Zoroark-GX / Seismitoad-EX. Durant wins through actively milling the opponent, Greninja takes multiple KOs in one turn, Primal Groudon-EX wins through establishing a slow, unbeatable threat, and we even used to have a pure combo deck through Unown DAMAGE. Sure, it’s debatable whether some of these strategies are healthy for the game — I’m not a big fan of Zoroark-GX / Exodia, personally — but there’s no denying that having a vast card pool offers many options to every type of player, even if not all of these options are currently top tier. This brings me to today’s deck, one of the most unique in the game — a deck that basically exists thanks to a technicality. Ditto Prism Star can evolve into any Stage 1 Pokemon, and this includes Stage 1 Pokemon that were not supposed to evolve from a Basic — I’m talking about the evolutions of Revived Pokemon. The best of those (apart from Archeops, which is banned) is Cradily, a Pokemon that can cheat Stage 2 Pokemon into play with its Lifeplosion attack. In this article, I’ll discuss how this weird combination gave life to a new archetype, give my list for the deck and explain how to approach various popular matchups. Lifesplosion is a truly unique attack that’s finally playable, more than five years after the release of Cradily from Plasma Blast. It can potentially set up several Stage 2 Pokemon in a single turn. That said, although one might be tented to build the whole deck around Cradily, it’s not advisable. You can only play one Ditto Prism Star and there’s no getting it back if it’s KO’d, so it would be extremely risky to build a deck that depends on Cradily to work. What’s more, Cradily’s 120 HP is not much, so you need to use Lifesplosion as soon as you can, even if there’s only one Energy attached to Cradily. If you wait until you’ve attached more Energy to it, you run the risk of getting it KO’d via Guzma — again, because Ditto is a Prism Star card, there’s no way to recover it. Finally, you also need to manage your Bench space. These issues all point in one direction: Cradily needs a partner. The best answer seems to be the Sceptile-GX line, for multiple reasons. Grovyle is an amazing Pokemon, with an Ability that makes it far more reliable to set up Stage 2 Pokemon in such a fast format. Sceptile-GX’s Mach Cut is very efficient against Zoroark-GX because it slows them down, while its 230 HP makes it impossible to OHKO. Power of Nature Sceptile is a great tech card against Ultra Beasts, and helps a lot against Buzzwole-GX. 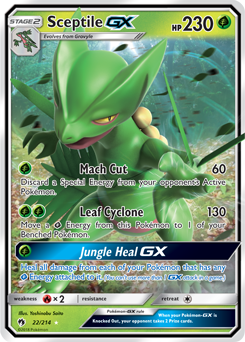 With its inclusion, the deck becomes a Sceptile-GX deck, that can hold its own even if Ditto or Cradily is prized. If they’re not, though, you can use Grovyle to search out Cradily on turn two and set up a Stage 2 Pokemon. Which Stage 2 Pokemon, though? Although you can use Lifesplosion to directly set up a Sceptile-GX, it’s not the best use of the attack. You can actually use the opportunity to include some of the powerful Stage 2 Pokemon that are revealed in every set and make you think “too bad it’s not feasible to tech a Stage 2 line in a deck”. Some examples include Dusknoir BCR and Magnezone PLS. Another very powerful card that makes an unexpected comeback is Vileplume, whose Ability is extremely disruptive to many Expanded decks. Thanks to Cradily, Vileplume can easily be set up on turn two. The heavy focus on this line is logical given that Grovyle‘s Ability is the deck’s engine. Sceptile-GX is not an amazing attacker, especially in Expanded, but combined with other disruption cards, it does a decent job taking KOs, even if it’s not in as explosive a fashion as decks like Rayquaza-GX. Although Vileplume can be set up through Lifesplosion, you can also evolve it naturally from Oddish. This double approach ensures that you can still set up Irritating Pollen even if you can’t Lifesplosion. It also makes it much harder for an opponent to get rid of the Item lock. To do so, they must KO Cradily and Vileplume. If they KO Vileplume first, Cradily can set up another one before they have a chance to use Items. Therefore, they need to first KO Cradily, and then Vileplume. However, when Cradily is gone, you can set up another Vileplume naturally, so that if the opponent KO Vileplume, they’ll still have to face another one. It will be very hard for them to use Guzma thrice to Knock Out each of your Bench sitters, given that they don’t have access to VS Seeker. Given that Vileplume is an integral part of the strategy, the deck doesn’t want to run too many Items. Instead, it plays much more Supporters, including Lusamine to use them over and over.